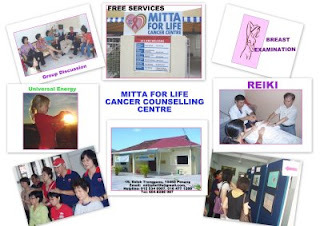 Mitta For Life Cancer Centre started on 22 May 2005 with the aim to provide free counselling service to cancer patients and their families in coping with the illness. It has been four busy years since that eventful day. We have seen a significant increase in the number of patients walking through our doors, seeking the various services we provide. There has been much joy in seeing the vast improvements in the quality of their lives as they fight the disease bravely. There has also been sorrow when we lose our beloved friends to cancer. Nevertheless, we carry on with our services with renewed strength, faith, hope, courage and a very large dose of loving-kindness and compassion. We will be expecting more patients to walk in as the word about Mitta spreads. At this point, I would like to say to every cancer patient, we welcome you with open hearts. We want you to know that there are no strangers at the Centre…. only FRIENDS for life! We have also seen an increase in the number of volunteers, a testament to the fact that even in this current materialistic world we live in, there are people who still believe strongly in a culture of sharing, caring and loving without expecting anything tangible in return. With support from volunteers, well-wishers and friends, our services and activities have also taken on a more positive note. Last year, we were able to participate in a number of outreach programmes such as conducting Breast Cancer Awareness Campaigns during Vesak as well as at the Greenlane Convent Primary School Fundraising event. We also visited an orang asli camp where we shared with them the provisions we brought from Penang. Many of our friends and volunteers also embarked on a holy pilgrimage to India last year, together with our Patron, Venerable E. Indaratana Thero. We took part in numerous fundraising activities such as food fairs, where our volunteers once again showed their mettle in preparing food and craftwork for sale. One of the highlights of last year was the Mitta Family Day, where the Mitta family had a great time sampling all the delicious food laid out at the table, singing and receiving gifts. Our ongoing activities, such as the Reiki sessions, the weekly Taiji classes and the monthly Health Talks were enthusiastically welcomed too. At this juncture, the working committee and I would like to extend our deepest appreciation to our Patron, Venerable E. Indaratana Thero, for the support, encouragement and motivation to us. I would like to thank the Temple Management Committee for all their help and support too. A word of thanks to all our donors, well-wishers and contributors for their generosity and kindness. And finally, to all our volunteers, Mitta cannot succeed without you. You are the personification of Mitta For Life indeed. Thank you. Talking can give them support. Talking about something teaches you how you feel about it. Talking about a fear or worry often stops it growing larger in our minds. Conversation about something important or personal produces a bond between participants which is valuable in itself. Talking helps them feel in control of their situation Very often when the diagnosis is cancer, it feels as if we have no control over the disease and its treatment. Now two of the things that decrease these feelings are information and being able to talk things over with other people and let them know what you think. The more information you have about your situation and the better you become at talking about, the more you feel involved in your own care and the more you feel in control. Knowledge of their illness and its treatment gives some form of power. These are based on my observation of patients during my counselling sessions with them. I wish you all well. With breast cancer on the rise, we at Mitta are very concerned with the lack of information women have on breast care, pertinent health checks and a fundamental knowledge on the risk factors that cause cancer. While many women may profess to know what breast cancer is all about, they neglect going for regular clinical examination and do not perform monthly breast examinations on themselves. 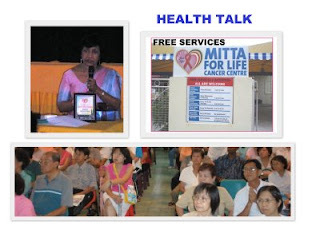 Last year, Mitta carried out two major Breast Cancer Awareness Campaigns, the first being held on Vesak Day 2008. More 100 women registered for the free breast examination conducted at the onsite clinic in the temple grounds. The second campaign was held in the month of September, at Green Lane Convent Primary School’s Food and Fun Fair. About 20 ladies had their breasts examined. Mitta also launched a Breast Cancer Awareness Campaign during this year’s Vesak celebrations at the Dhammapida Centre in Ipoh on 9th May 2009. A total of 39 women registered for the breast examination session. They were also taught the techniques of Self-Breast Examination by the Breast Examiners present. At Mitta Cancer Centre, we advocate early detection and prevention of the disease through outreach programmes and exhibitions. Free breast examination is available on the 1st and 2nd Saturday of every month at the Centre from 2.00 pm and 5.00 pm. Come and speak to our Counsellors for more information. I was initiated with Reiki since December 2007. During this period, my irritable bowel syndrome and arthritis have improved tremendously. Each time I practice Reiki, I feel a warm tingling sensation in my hands. When I practice Reiki with other practitioners, I feel that my hands seem to transmit heat. There are other sensations throughout my body too. Sometimes I feel cold, other times I feel so warm that I would sweat. There are also times when I feel pain in my shoulders and numbness in my legs, but these go off after 5 to 10 minutes. One special thought I wish to share here is that knowing whenever I lay my hands on others when I practice Reiki, I could feel love and care flowing to and fro from all the participants. It almost seems like an ability to communicate innately. Finally, I will keep on learning about Reiki so that I can continue to help others. When I enter the premise of the Mitta Centre, a sudden feeling of peace and calm seems to dawn upon me. I meet with the members of the Centre who are full of care and concern for everyone who needs their invaluable services. Though for the latter, it is a feast of the Reiki energy, but it ends up in everyone having a good feast of the cookies and niceties brought by the members. As I lay in the room to receive the Reiki energy, the practitioners dutifully and conscientiously do all that they can for me. The 3 or 4 volunteers put in their best to make us better from whatever health problems that affect us. All through the session, I could feel the soothing and comforting effect of Reiki. When the session ends, I seem to feel much lighter; as if the Reiki practitioners have lifted off some of the burden from my body. I feel touched and grateful for what they have done for the many of us who visit the Centre. My hat off to them, the doctors who give free consultation, the administrative staff of the Centre, the Committee Members and everyone who have helped to make the Centre a place of solace for many who need it. All of you have done a noble and wonderful job indeed. Thank you from the bottom of my heart. Keep up your good work and may all of you be blessed with good health and happiness always. One year ago, I recall my first visit to the Mitta Centre. It was highly recommended by close friends and relatives that I explore the place. I decided to visit as soon as I was mobile enough as everyone who spoke to me about it had only positive experiences and stories to share. My wife, Sue, accompanied me on a Saturday afternoon to be warmly greeted by the volunteers of the Centre. I got registered and was made to feel very welcome and at home….Like what they say, a smile goes A LONG WAY. My twice a week sessions was something I always eagerly look forward to. The Reiki self healing made me feel better both mentally and physically. Hence I registered for classes under Mrs. Jorva Hamilton and could administer the healing powers onto myself. It was a surreal feeling to be God’s instrument as I heal myself in my own way. Apart from Reiki, I am excited to meet other friends, have a chat, share experiences and stories and the environment at Mitta makes me feel well both mentally and physically. Today, I boast that I am a living testimony of the harmonious experience I received from Mitta Centre. Many Friends would concur with me and is quite apparent from the recent expansion and refurbishment of the centre; that we need a bigger space to share the comfort for the many who seek. All the positive experience is made possible through the efforts of the volunteers, many of whom have become very close friends to my family and I.
I pray that God continues to shower His bountiful blessings on all the friends, volunteers, doctors as they continue their dedication and commitment to sacrificing their time and effort for the goodness of mankind, God bless you all. In the Maha Parinibbana Sutta, the Buddha told his chief disciple, Ven Ananda that there are 4 places that a devout person should visit and look upon with reverence and be inspired after He was gone, namely Lumbini (His sacred birth place); Bodhgaya (place where He gained Enlightenment); Sarnath (place where He delivered His first sermon at Isipatana) and finally, Kusinagar (where He passed away into Nibbana). 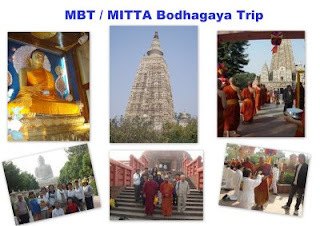 The MBT - Mitta Pilgrims, led by Ven. E. Indaratana Thero, went on a sacred pilgrimage to revere and be inspired by the Great Teacher, Buddha Gotama. It was indeed a happy memorable, inspirational and a great spiritual experience for all the pilgrims. The pilgrims went in 2 groups. The first group departed from Penang on 15th Nov 2008 with Venerable and participated in the full 18 days pilgrimage . The second group joined them in Bodhgaya on 24th Nov 2008 for the remaining 8 days. Eleven of the participants had a great spiritual experience which words cannot describe how they felt when they were performing their pilgrimage in the Great Land of the Buddha. It was very meaningful and fulfilling! All these were made possible by the good coordination and planning of Ven. Chief Rev. E. Indaratana who ensured that nothing is missed out for a successful pilgrimage which included transport, food and accommodation. 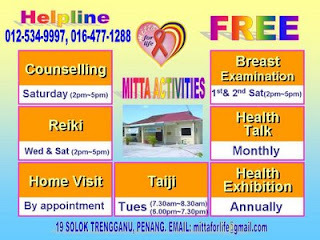 As part of the Vesak festival for this year,Mitta for Life Cancer Counselling Centre sent a team of doctors, nurses, health professionals and volunteers to Ipoh to set up a series of activities as part of its Health Outreach Programme. The activities included a Health Exhibition, free health check (blood pressure, body fats, blood glucose), free consultation with doctors on general health issues, free dental services and free breasts examination. The busload of medical personnel and volunteers started off from Penang at 5.30am on the morning of Vesak Day, arriving at Ipoh Dhammadipa buddhist society at 7.30am. After a hurried breakfast, Joy Clinic was transformed into an ad hoc clinic - complete with consultation rooms, examination rooms and even a dental clinic! There was not a moment of rest from the time the "clinic" opened for Free Health Check to the time it closed at 12.30pm. There could easily be more than 100 multi-racial participants from all walks of life, and from varied age groups. The ladies who attended the free health check were also encouraged to go for the free breasts examination where they were also taught the techniques of Self-Breasts Examination. The Mitta team was also very much supported by volunteers and medical personnel from Ipoh too. 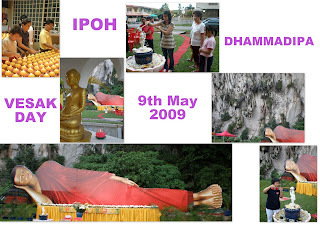 "In the early morning of Wesak Day, 8th May 2009, together with other volunteers, we left MBT at 5.30 am in a van for Dhammadipa Centre in Ipoh. I was glad to be back, this being my second visit, and to witness the centre taking on a carnival-like look with the tents set up for the food and jumble sales stalls on the open field below the towering cliffs. Adjacent to the stalls and sprawling on the ground was a huge, cardboard cut out of a reclining Buddha. It was really so beautiful and breath-taking to see the smiling countenance of the Buddha, radiating His love to all mankind. After a quick breakfast, Ms Lee Ee Lin, a fellow pharmacist, and I proceeded to set up our table for blood glucose testing. We had a good crowd (close to 80 patients), largely Indians and some Chinese, that came for the screening tests. Several of those tested were diabetics and despite medication, had very high fasting blood sugar. Ee Lin and I advised them accordingly on nutrition, healthy lifestyle and importance of medication compliance and referred them to see the doctor. The time seemed to fly by so fast and soon the last patient was cleared. We had our lunch around 1 pm and then packed to go home. The ride back was smooth with most of us nodding off for the most part of the journey. It was great to be a part of the medical screening team at Dhammadipa and we look forward to be of service again." The holiest day in the Buddhist calendar is none other than Vesak day - a celebration of birth, enlightenment and death of Buddha. 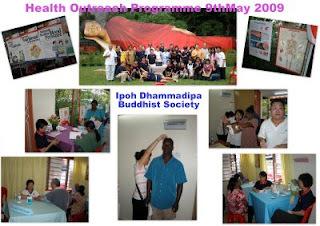 In conjunction with this year's Vesak celebrations, a team of Mitta volunteers went to help in the Ipoh Dhammadipa Buddhist Society on 8th & 9th May 2009 in support of the beloved Ven. Chief Rev. Indaratana. Once again, Mitta volunteers have shown their mettle when it comes to helping others. On 8th May morning, a team of four carloads of volunteers made their way to Ipoh Dhammadipa to help set up stalls and cook food for the food fair, set up the health exhibiton booth. They also helped to ensure that the candles lighted for the occasion remained burning throughout the night. Deprieved of sleep and rest, they put in their best effort without any expectaions and were rewarded richly for the joy and devotion they have shared with the people of Ipoh. As the temple was only set up a year ago, the support from the multi-racial neighbourhood makes up for the participation in the various activities available that day. That really made Vesak 2009 a memoriable day to the volunteers, who left Ipoh deeply inspired by the 2 days' sojourn.